Air velocity pressure survey (airflow through each 600x600 vented floor tile). We follow up the air velocity pressure readings with a survey of a low, medium, and high height range of temperatures and humidities - low = 6U (267mm), medium = 30U (1,334mm) and high = 50U (2,250mm) at the middle and end of the aisles. 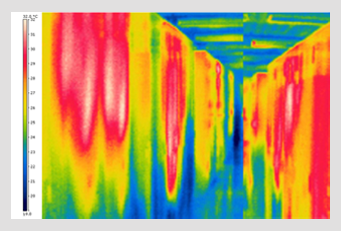 How the air temperature in the cold and hot aisles is performing and where hot air is returning to the cold aisle. Assessment of the balance of air pressures and velocities from the floor plenum and observations drawn from these readings to show air starved areas. Thermal images showing possible heating issues in the room. Hot spots are easily identifiable giving a clear indication of poorly cooled areas. 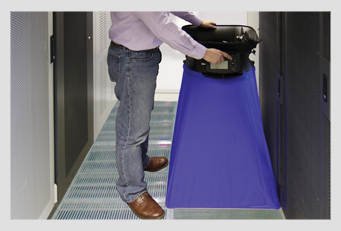 Recommendations to improve the efficiency of existing active kit through relocation.